Which social enterprise is distributing brand-new goods to charities? An organisation that helps businesses clear excess stock and at the same time stretches the charitable dollar further by distributing brand-new goods to charities for Australians in need? That’s exactly what Good360 is doing, says Susan Wallis. Doing business costs money, regardless of whether it is a private company seeking returns for shareholders or a charity or nonprofit enterprise that is making a real difference to the lives of Australians who need a hand. Good360 Managing Director and Founder Alison Covington (pictured left), who has a successful track record in management in the transport sector, discovered the Good360 model operating in the US and wondered why no-one in Australia was helping the charitable and nonprofit sector in the same way. In Covington’s words, it was a “no brainer” to distribute excess inventory from the retail sector to stretch the grants and fundraising of charities and get the goods into the hands of people in need. 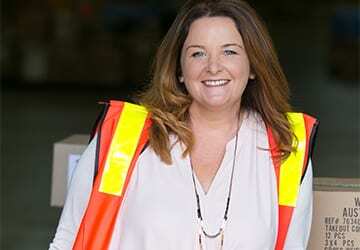 Now in its second year of operation, with over 500 charities registered and over $12 million worth of donated goods provided, the goal for Good360 is the distribution of $1 billion worth of goods in the next decade, and with big brands on board, including Woolworths, Linen House and Shoes of Prey, this target is very doable. The Good360 concept is simple. Businesses have excess unsold goods and charities need products to run their enterprises as well as to service the needs of Australians doing it tough. Good360 is the ‘connector’ to get the goods into the hands of the people who need them most. Behind the scenes is a sophisticated IT and logistics system, a massive warehouse and an amazing team, led by Covington, many of whom are highly skilled and much valued volunteers. Registered charities have access to the products via the easy to use Good360 website and receive regular updates on stock levels and new additions to encourage them to go ‘shopping’. Member charities pay an annual registration fee of $250 plus GST and then only a nominal shipping and handling fee to get the goods delivered right to their doors. The brand-new goods are free, which stretches nonprofits’ budgets further and means they can channel the funds they save into their causes where it matters the most. OzHarvest ACT has been utilising Good360’s services for over a year thanks to the sponsorship of their annual registration fee by the Snow Foundation. “Good360 has been so easy to use, and has also given us access to items and equipment our charity needed but could not afford to purchase. The great thing about Good360 is you only pay for the delivery of any item you order. This constitutes huge savings for us, savings we can redirect to food rescue!” explains OzHarvest ACT & Territories Manager Dave Burnet. Good360 surveyed the charities already benefiting from the generosity of their donors to find out what products were most needed. The top four items were stationery, bedding, toys, and bath and body products. With this information, Covington and her team were able to reach out to potential corporate partners to fill these gaps and get the goods to the community. Recognising that the needs were greater than what was currently available via Good360, the organisation requested that a wider survey of the nonprofit sector be undertaken by HLB Mann Judd. The results showed a real need, with 45% of nonprofits advising that their clients went without vital products altogether and the requirements included a long shopping list of items, including linen, towels and nappies. Good360 will be seeking these from future donors and retail partners. Competition for grants and fundraising continues to grow and there will always be people who need a hand at some point in their lives. The requirement to stretch funding further is ever increasing, as is the desire to reduce the pressure of fundraising in an overly saturated society. Good360 welcomes partners at all stages in the circle of giving – charities, volunteers, manufacturers, retailers and pro bono support on all levels – so they can get more of what businesses have too much of and put it into the hands of the people who need it most. You can read about the impact stories and how you can get involved by visiting good360.org.au. Susan is a fundraiser, volunteer and small-time philanthropist as well as a freelance writer. Her main passion is as Chairperson for Interchange Illawarra Inc, a nonprofit disability service provider. Susan is also a member of the Good360 Advisory Council.